Quatermass and the Pit, Doctor Who, Horror Express, The Legend of Boggy Creek, Dark Shadows and more. A musical collage to reflect the influence of the cathode ray wet nurse that was TV from the 60&apos;s through to the 80&apos;s in all it&apos;s Folk Horror/Sci-Fi wyrdness. 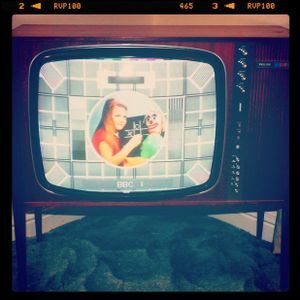 These were the programmes and their themes tunes that had a profound effect on a generation and sowed the seeds for the music of the hauntology scene and shaped the minds of those behind all things retro-futuristic. The next programme will begin after tonights visit to Newsround - do not touch that dial and don&apos;t forget to wash your hands before tea!! Shadows Of Fear by Roger Webb is such a brilliant piece of creepy music. I enjoyed all the others too - thank you for uploading! Was Shadows of Fear ever released on a library LP? Crown Court! I would never have got that - but no wonder it dredged up memories of skiving school. I tried my best to wake up those long forgotten memories and it is amazing how different some of these tracks become when taken away from a title sequence and mixed together. The one that works the best in that way was the Midsomer Murders Theme - a waltz on a Theremin with saw accompaniment….what’s not to love about that!? I found it was Picture Box by reading the comments - I really should have thought of that earlier. However, 22.40 isn&apos;t &apos;Shadows of Fear&apos; - it&apos;s the flutey one - very pastoral, early Sunday evening feel. Absolutely love your stuff by the way - perfect accompaniment/antidote to making corporate videos! It&apos;s `Distant Hills&apos; by Simon Park Orchestra which was the theme to Crown Court...sorry Shadows of Fear is at 20.40 - my mistake! Thought it tagged at time - I mean at 22.40 and the one at 08.01. Love, love this. Wow - hearing the Tomorrow People theme gave me goosebumps! Chocky! Terrifying....Very nice chilling mix!